How and why do you use your HP calc? / How and why do you use your HP calc? I was wondering what is your reason for using a HP calculator. I have no particular reason for asking this besides my own curiosity. For example, are you using an HP calc because you're a science student, an engineering student, a science teacher or professor, a research scientist a hobbyist who likes programming, etc... And which calc are you using. My personal reasons are quite simple. I am an IT engineer (used to be a software engineer a long time ago). 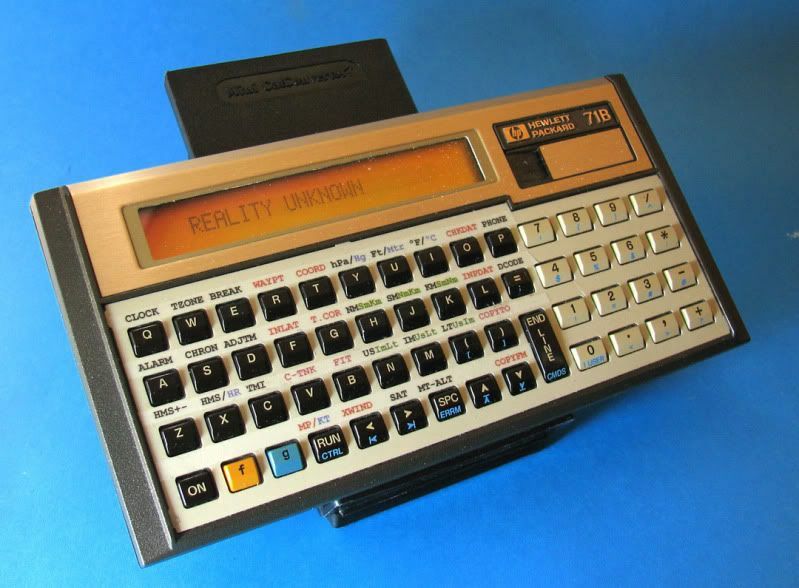 So when I could get one, even though more advanced and powerful calculators and computers were available, I still had to get one. I had no real-life or actual practical use for it though. I just wanted to fulfill that dream, owning an HP41! I still don't have an actual real-life use for it (or for any real physical calculator for that matter), but I like challenging myself to program it and play with it. Although I find it more challenging to find something to program! I do the same sometimes with my 50g, but it's, even though way more powerful in every way, definitely not as fun. So it doesn't get used very often. I consider myself to be just a small hobbyist still trying to learn all I can about that awesome piece of computers history. So if you don't mind sharing your thoughts and reasons, please feel free to do so. RE: How and why do you use your HP calc? Nice! I thought you had an earlier version, similar to the one I have, which I saw in a post somewhere, where you explained where to install the additional cap for the display drivers. My CX is not gonna be "CL'ed" just as yet. Don't want to waste the built-in time Module. Where do you get these custom overlays BTW? First, don't CL a CX. Use a C or CV and find a time module or wait for a possible new CL version with time chip built in. Secondly, you are correct, that is a CX but that overlay now resides on my CL overlay. Correct, it was a 1979 C which I updated to CL version one. Thirdly, I created a word file which I printed on white paper. I corrected font size and shifted the position of the text until it was correctly aligned. I then printed the final result on clear vinyl label stock. Cut the horizontally to fit a blank overlay. I bought my hp 50g at the end of 2010 and before I was happily using (and I still use) my sharp el 506w. Reason: when I was studying in the university I did not want to use a bulky computer to crunch some numbers. Moreover moving the head up and down (look at the desk where there are the notes I am writing, look at the monitor, look at the desk, look at the monitor, etc...) was infuriating. So with a calculator I could first develop the needed program and then work only on the same plane (where notes and calculator would lay), without stress for my neck. Then I discovered how amazing is the environment of the 50g. Unless one has a computer with a ready made math environment (maple, matlab , mathematica and so on), using a normal programming language (basic, python - I don't like the forced indentation of python though -, pascal, bash, java, c#, what not) requires way more "setup". Find a math library, import it, adjust the parameters for the library, process the result and so on. Instead the 50g has so many commands ready to be used that makes the development phase really quick (if one knows the commands), The execution may be not quick, but it depends on the size of the problem. It is still working (I lost the power adapter though) and it is really great to show PDF - the main reason I bought it - or videos. Videos have to be loaded via usb. So, once I got hooked with the ease of developing a program about a math problem with the 50g, it became my comfort zone. Every time I think about a problem (recently one about statistic . How large should be a sample size to reproduce properly the real distribution of choices in a population) my first approach is to use the 50g because it is real quick. This is even more valid with library additions (see ListExt from David, goferlist and so on). I used scilab in the past as free alternative to matlab and mathematica, but I still find the 50g quicker (remember: comfort zone). Sure for something like trees, graphs and so on, "casting them" in list format on the 50g is quite a work (a programming language with structures or objects would easily be better). So when I try to use a "tree" with the 50g, it is more to refresh my algorithmic skills than something else. Instead for math related operations, the 50g is awesome. and that's it. With the evolution of newRPL the 50g may become more useful and way faster. Amazing. That is also the reason why so far I did not try any other math environment (the need arise only when the memory on the 50g is not enough) and I really should try to use the hp prime to process some large input and burn a bit the unused CPU (well, not true, the CPU runs BOINC ) on the android devices that I have. (09-14-2017 05:46 AM)pier4r Wrote: With the evolution of newRPL the 50g may become more useful and way faster. Amazing. I didn't even know there was a newRPL. I don't own an HP Prime, and probably never will, but I recall it has < = storage memory than the 50g and is not expandable via an SD card. I keep a vintage HP 45 on my desk at work for any odd calculation that comes my way. I usually carry a couple of others with me in case I need functionality that the 45 can't provide. Base conversions mostly but a few other things are sometimes required. I love the 45's LED display more than the LCD models. At home, I've got an HP 25, an HP 32sii and a WP 34S next to me and I grab whatever. I initially got the 41cx to use as a hand-held controller of instrumentation on the workbench, through HPIL and the various interface converters to IEEE-488, RS-232, and parallel. Today I still use the 41cx every day—not much as a controller anymore, but as a calculator, timer, alarm clock, a daytimer that reminds me of upcoming appointments upon turn-on, calendar, tracker for how much time I spend working on different accounts for my clients, and occasional notepad and phone directory. (The slowness of its text editor limits the scope of the last two.) As you might have figured out already, I don't use a smartphone. I told a friend, "I don't like what smartphones have done to society," and he retorted, "I'm ahead of you there. I don't like society!" (although he uses a smartphone). I don't really have any use for a modern graphing calculator. For my original purpose in getting the 41, the newer models have not been suitable HP-41 replacements at all. They are what I call "supercalculators" (all one word), and not hand-held computers that can be used as controllers. They're just small consumer appliances. I want the interfaceability to lots of workbench instruments at once, without going through a PC. The workbench is always too messy to depend on communication with IR beams. Things are always in the way. And USB and Bluetooth have their own set of problems. HP-IL was much better. I use my HP-50G to provide scratchpad use of aircraft values. I fly in a virtual flight simulator, and I've found that holding passenger headcount, cargo weight and fuel weight in an array is a way to jot them down in a volatile (i.e. they'll change each flight) way. It saves me paper, in exchange for a few billion electrons moved from place to place. I'm also working on a small project to convert my Casio BASIC program into RPL. I'm also trying to learn RPL (hence (2)), which partially answers your "and why" question. Keeping my brain a little 'stretched' might just help me retain a few more of my limited store of marbles. I'm storing a list of shopping totals so I can keep a running total of what we spend throughout the year on groceries. I've yet to figure out how to sum those arrays, but I'll post that request somewhere else after I've done some reading up (no sense in derailing this thread). I believe there's been a thread posted about my small issue before that I'll check out. I'm not a professional, so my usage of the calculator is purely for interest's sake and not for a job. I use the 50G because it's another tool and a very viable alternative to my Casio fx-9750GII. I only own one HP calculator which is a HP 12C Financial. Before I buy this I buy the App version first to learn and see how good is it for everyday use. I do use the app version more often than the physical unit at home. To me HP Financial Calculator is good for everyday use to calculate all kind of money related stuff. I do use the App version on the cell phone more often since it always with me all the time. For HP 15C App I use it to learn how to program and learn math related stuff. I do highly recommend to people who never try any HP calculator should try out the App version to see how you like it before purchase one. HP Prime App do have the Free version to try out too. I generally like them because they allow a great deal of customization for your workflow. For example, on a 17BII, 27S, 19BII, etc. the solver lets you add functionality that closely mimics the built in tools. Need to be able to do computations for an annuity with an interest rate that changes after a set number of periods? Just type in the equation. It's similar for the scientific models too (excepting the Prime, of course). Programs that can manipulate the stack and system state, custom menus, user key bindings, etc. You can get your work done with a minimum of keystrokes and memorization of manual routines. My one lament is that HP has never included very many statistical regression models. They could at least add polynomial, sinusoidal, and logistic (I think I noticed the Prime finally has a lot more, fortunately). I also wish the RPL models had better support for interactive, "terminal I/O" kinds of programs, like one might do on a TI with Disp, Input, and Output. What model are you using? What do you use it for, could you be more specific? - Free42 for quick calculations and non-linear equation solving. - HP50g most of the times "just" for non-linear multiple-equation solving (SolveSys49). (09-14-2017 03:04 AM)Neve Wrote: I was wondering what is your reason for using a HP calculator. Hi, Neve, Bienvenue sur ces forums. 1.- As a collector of HP and non-HP machines, I like to use them occasionally to dust them. 2.- Also a good opportunity to refresh my math school days, by reading and testing the information posted here by our math expert members. And we have in this museum forum so many great articles/comments on math (check the archives as well)! 3.- Working with computers since 1980, I shouldn't need a dedicated physical calculator anymore for any kind of calculations. 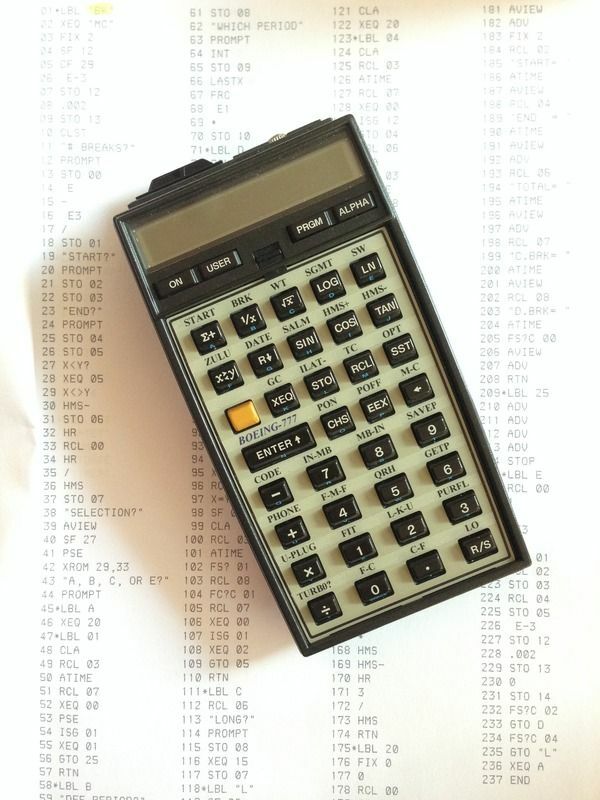 Before that, specially at school in the mid 70's, where only a few people could have access to mainframe computers, a scientific calculator was the obvious solution to compute/program a computer. That said, these days a dedicated calculator can be so more convenient when compared to a virtual calculator, specially for fast and simple calculations. Electrical engineer. Use my 50g at work: pressing a single key is still faster than typing "sin", especially for more complex functions. And at work I don't have Mathematica as I do at home. Home: Use my WP 34S. Don't have to open another window and create a notebook, etc. just to bang out some values. If I need to do something many times, its programability handles smaller problems well. Mathematica handles the heavy lifting. And Excel/Open Office Calc spreadsheets are interchangeable with anyone else. What gets calculated? Mostly EE stuff: Circuit component values and conditions, radio frequency communications simulations but also hobbies such as amateur radio, astronomy, aviation. Plus the inevitable chores of taxes, budgeting, etc. With a brain tuned for RPN, these are my best tools. (09-14-2017 06:41 AM)Neve Wrote: I didn't even know there was a newRPL. 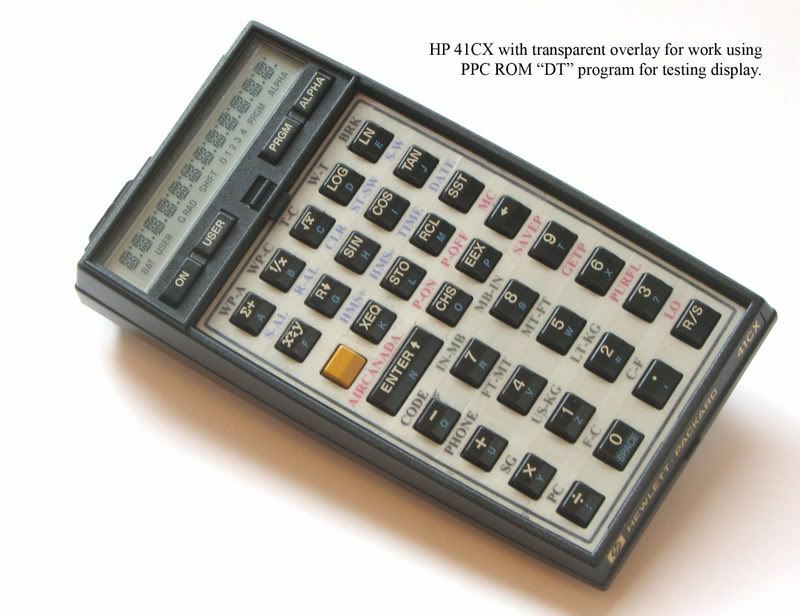 If only the HP Prime could be a real RPN calculator all the way down like the 50g or the HP41. Or, if HP could finally built a true HP41CX successor with modern technology, CAS and expandability!! Apart from not being a collector, it's pretty much my position on the subject.